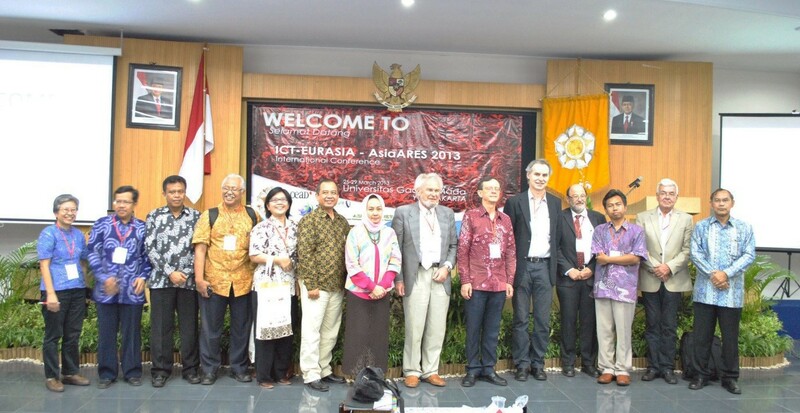 The ICT-EurAsia 2013 Conference was held from the 24th to the 29thof March 2013 in Yogyakarta, Indonesia. ICT-EurAsia was organized by SBA Research, Vienna in conjunction with the University Gadah Madja (UGM), Yogyakarta and the two University Networks ASEA-UNINET and EURASIA-PACIFIC. Within five days 120 conference participants and student participants from 17 different countries attended the accepted presentations on the latest research results in the area of Information & Communication Technology. ICT-EurAsia focuses on defining requirements of future systems in the area of ICT with a special consideration on fostering long-term relationships among researchers and leading organizations in the Eurasian continent.63 research papers were presented. Special emphasis was put on applications due to the initiative of IFIP TC 5. A special track focusing on availability, reliability, and security (AsiaARES) covers nearly half of the contributions. This track was mainly organized with the support of IFIP WG 8.4. AsiaARES was an attempt to bring the idea of seven successful consecutive ARES conferences which are supported by WG 8.4 to Asia. Within this track a pilot was started which offers virtual presentations for which authors submitted a video presentation in addition to their paper to allow a larger number of researchers to participate. Special thanks to Ilsun You for all his efforts toward this initiative. ICT-EurAsia 2013 was supported by IFIP TC 5 (IT Applications) in tight cooperation with IFIP TC 8 (Information Systems). The ICT-EurAsia conference aims to serve as a platform for the exchange of ideas, as well as experiences, and opinions among theoreticians and practitioners – at ICT-EurAsia 2013 we were proud to notice that this goal has been achieved. A successful conference, such as ICT-EurAsia 2013, is not only about having interesting discussions and sharing latest research results but also about establishing a community and a meeting point for researchers. ICT-EurAsia 2013 was extremely successful in this community-building aspect. Hence organizing a successful conference also means offering events beside the scientific program for creating an atmosphere which encourages the exchange of experiences and ideas. At this point we would like to express our thankfulness to Khabib Mustofa, Vice Dean for Information Systems and Planning Affairs at the Faculty of Mathematics and Natural Sciences, UGM, and his team for all their efforts to make ICT-EurAsia such a success. It started with a memorable Welcome Dinner that not only offered delicious traditional local food and music, but also a performance of robots dancing which were developed by students in the robot lab of the Gadjah Mada University . Organizing cross-domain scientific events like this originates from an idea of IFIP President Leon Strous at the IFIP 2010 World Computer Congress in Brisbane and is very much aligned with the many activities of the ASEA-UNINET (ASEAN-European Academic University Network) and the EPU network (Eurasia Pacific University Network) since both networks have a strong focus on ICT. The Conference was very honored by the presence of the Austrian Ambassador, Andreas Karabaczek at the whole first day of the conference as well as having successfully attracted Prof. Josef Küng (Johannes Kepler University Linz, Austria) to hold a keynote speech. Last but not least we have to mention the excellent contribution of the PC members and the reviewers. Due to the success of this scientific event it has been planned to organize ICT-EurAsia again in 2014. Universiti Teknikal Malaysia Melaka (UTeM) in Melaka, Malaysia has offered their willingness to organize ICT-EurAsia 2014. Due to the success of the AsiaARES 2013 track on availability, reliability and security it has been envisioned to further continue this special track also in 2014. IFIP delegates and ICT-EURASIA key-persons together with members of the executive board of the University Gadjah Mada and the Austrian Ambassador to Indonesia.